Congratulations That's How We Roll, the 2014 State Champions! Leslie Weishar (slightly hidden), Nicole Civetz, Derek Armstrong, Jeremy Head, Jason Osborn, Reese Romney and Mike Starr (not pictured: Dale Weishar). The team made it through the round robin achieving 8 points. This placed them on the single elimination Championship Board with one more match than the 15 other teams. 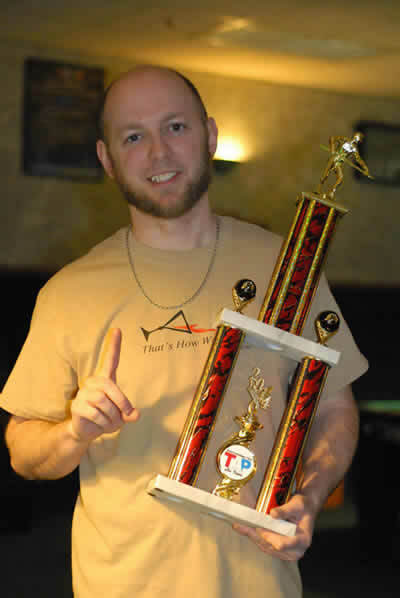 Going hill/hill against the Magic Q's, Dale Weishar won the final match in a sudden death match, one rack. 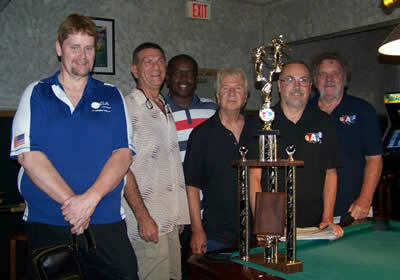 Next they won their match against the Rack Runners 3 to 1. Moving on to the next battle, they competed against Horseshoes and Hand Grenades, the 2013 State Championship team! Meeting the challenge head on, they won 3 - 0. From here, winning the match against Mickey's Hustlers (3rd place team) in a hill/hill battle and moving on to defeat the Crazy 8's (2nd place team) with a final score of 3 to 1 for the Championship win. These players fought hard and never gave up. It was a pleasure to see them all work together to make this happen, showing everyone what it takes to be a true team supporting, coaching and cheering each other all the way to the top! 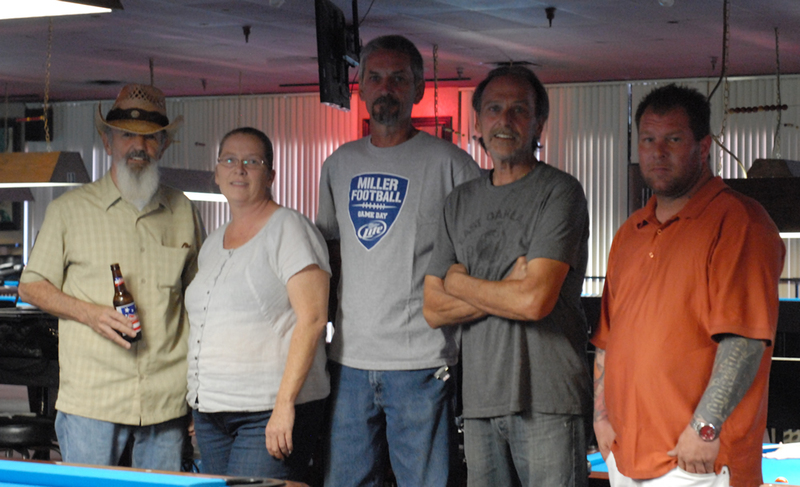 Congratulations to Crazy 8's for winning 2nd place, Randy Reinfeldt, Zeke DeRose, Aubrey Robinson, John Stanelle, William Tuczynski and Jim Edwards. These guys played great! Congratulations to Mickey's Hustlers, Rob Hately, Don Branson, Zach Franzi, Jason Osborn and Erik for winning 3rd place in the 2nd chance competition against the Renegades, 3 - 0. The Renegades shot well and fought hard taking 4th place. First, second and third place are advancing to compete in the 2014 Nationals in Dallas, Texas on November 12 through 16 to represent Nevada! Congratulations also to the English Majors for winning 1st Place and $600 in the Best of the Rest (2nd chance tournament) and to The Shooters for winning 2nd Place for $400. Pictured on the right are both teams. As you can see from this photo, they had fun....great bunch of guys! Congratulations also to Richard Valenzuela for winning the 50/50 raffle and $144! A very special thanks to all of the teams and players for their participation, show of excellent play, good sportsmanship and for playing TAP. It is because of all of our dedicated players that we are able to provide league play, these events and the prizes that we do. 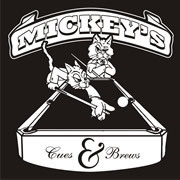 A very special thanks also to Shawn and Robin of Mickey's Cues & Brews and all of their staff for providing us with such an awesome venue and for the hospitality! 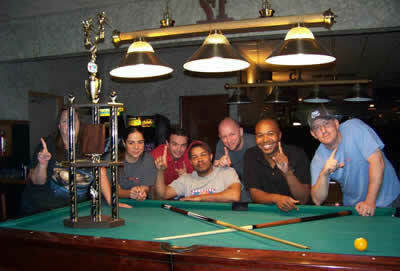 The 8-ball team tournament is said to be the largest locals-only team tournaments in all of Las Vegas with a prize fund exceeding $12,000. 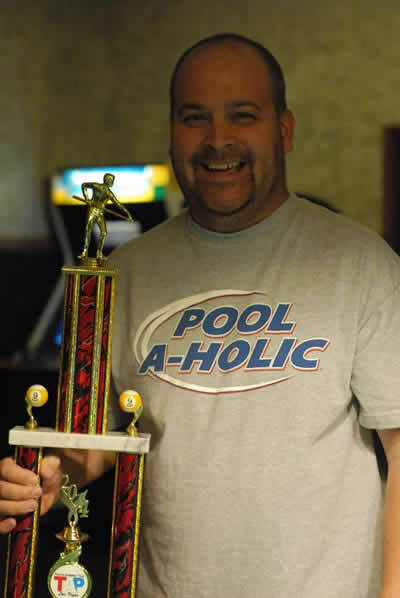 A full field of approximately 28 to 32 teams for 8-ball and 6 teams for 9-ball with close to 200 players competing!! TAP Nationals is held in an exciting different city every year. For 2014, we will be traveling to Dallas, Texas and staying at the Hilton Anatole! Then in 2015, we'll be off to Nashville, Tennessee and staying at the Gaylord Opryland Resort! 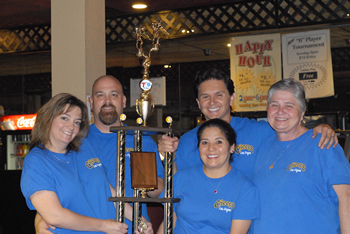 Congratulations Cheers 2 U, our 2014 Vegas Masters 9-Ball State Champions and to The Outsiders for winning 2nd Place! What a great event this was! Teams competed in this 2 day State Championship to advance to Nationals and compete in Dallas, Texas at the Hilton Anatole. Joining us in Dallas, Texas will be Scott and Tina Moden, Jim and Anne Carmona and Donna Schwitters. Jan Schwitters is also a part of the team and handily contributed to the win, but unable to attend Nationals. Congratulations to all! Read more about this event and learn how you can be a part of this annual event in 2015! Congratulations to all of the winning players from the 2nd Annual Vegas Masters Singles 8-Ball & 9-Ball Singles State Championship Tournament Series, held at Mickey's Cues & Brews on April 5 and 6, 2014! This annual event was designed to promote and recognize excellence in play and provide players with an opportunity to advance to compete at Nationals!! Only the top players in each bracket are invited to compete! This year, we had 4 brackets. With the projected continued growth, our goal is to have 5 brackets and split the 8-ball 4/5 bracket in 2015! 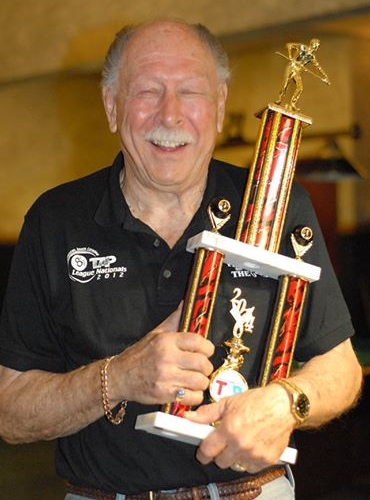 Seventy-nine players gathered at Mickey's to compete this year and 8 players advanced to compete at Nationals, winning prize packages worth over $3,500! We have a new State Champion in each bracket! The 4/5 bracket, being our largest bracket, awarded 3 places and we awarded two 2nd chance places. 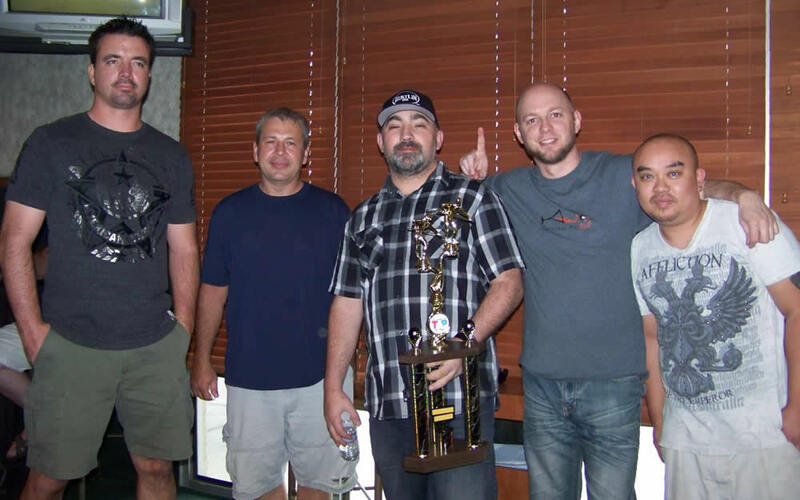 All 4 of our 2014 State Champions went undefeated in the double elimination tournament brackets: Leslie Weishar, Jason Osborn, Howard Dameron and Scott Moden. Below is a list of all of the winners. Even those who didn't make it to the very top can walk away with pride after having competed against some of the best players in Vegas! The players listed above with "Dallas" after their names will be competing at TAP Nationals in November 2014! Nevada will be very well represented! Congratulations to all! 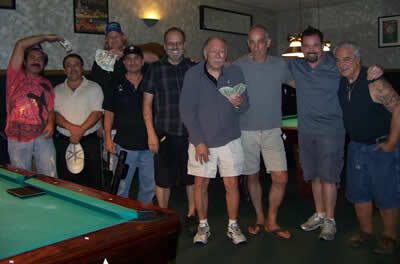 We collected $222 in the 50/50 raffle, which was won by Zeke DeRose. 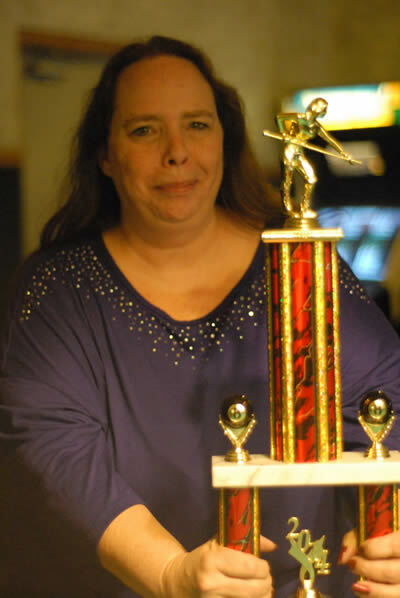 A very special thanks to Donna Schwitters, Debbie Dios, Kathy Kettel, Darrell Jeff and Scott Moden for all of their assistance throughout the tournament. Without you, it would not have been as successful and fun as it was! 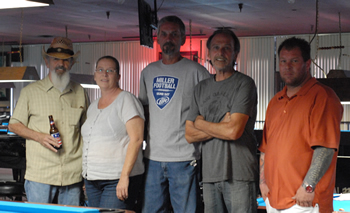 A very special thanks also to the staff and owners of Mickey's, Shawn, Robin and Christina for the hospitality! NOTE: Should any of the players listed to go to Dallas be unable to attend, the prize packages will be handed down to the next person in line.